Superworms also have the ability to bite, unlike mealworms, and have a small pin on their backs they can use for attacking, similar to a scorpion, so use caution when feeding to a younger animal! Superworms are much more active than mealworms, which makes them more desirable in some cases, specifically, if your pet enjoys hunting or is a picky eater. 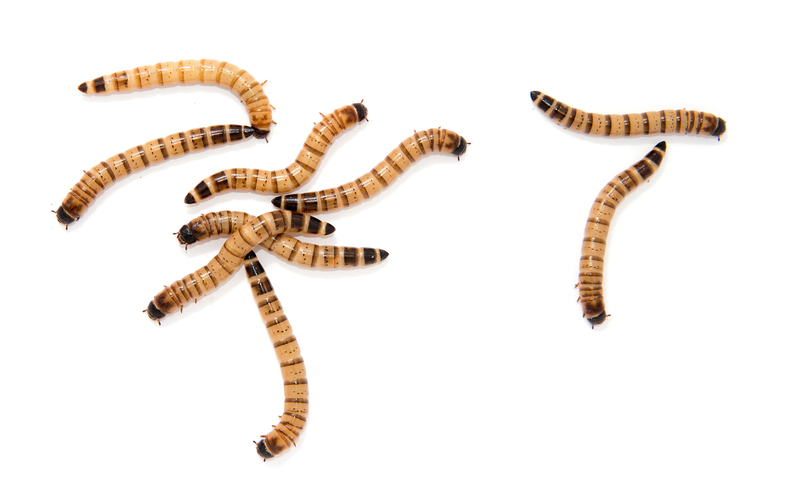 Many insectivorous creatures are attracted to movement, which makes superworms a desirable choice. Superworms also last longer than mealworms in the pupae stage; superworms stay as pupae for upwards of three months while mealworms only last a few weeks. However, superworms do not last in a refrigerated environment, unlike mealworms, as cold temperatures don’t send them into hibernation. A one thousand count bulk of superworms can be kept in a large plastic container, with air holes in the top. You should cover the superworms with a thick layer of wheat middling, oatmeal, or Fluker's mealworm bedding to provide bedding and a food source. Superworms are relatively easy to keep, just keep them at room temperature. Place slices of potato on the top for water. As said before, Do NOT refrigerate the superworms. Unlike other feeder insects, refrigerating superworms does not cause a hibernation.